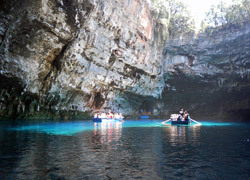 The island of Kefalonia is known throughout Greece as a special place where, in addition to the natural beauty of its landscape, there are strange and rare natural phenomena. 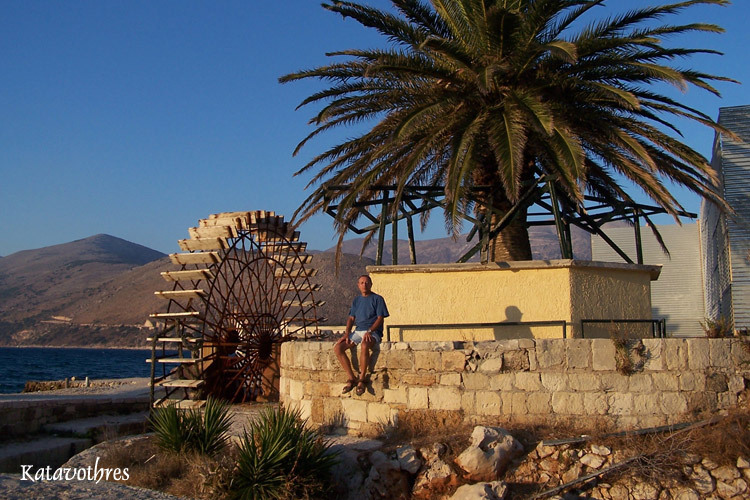 The island of Kefalonia is known to be a land where particular phenomena occur, and this section of our website we want to bring you in discovery of some of them. 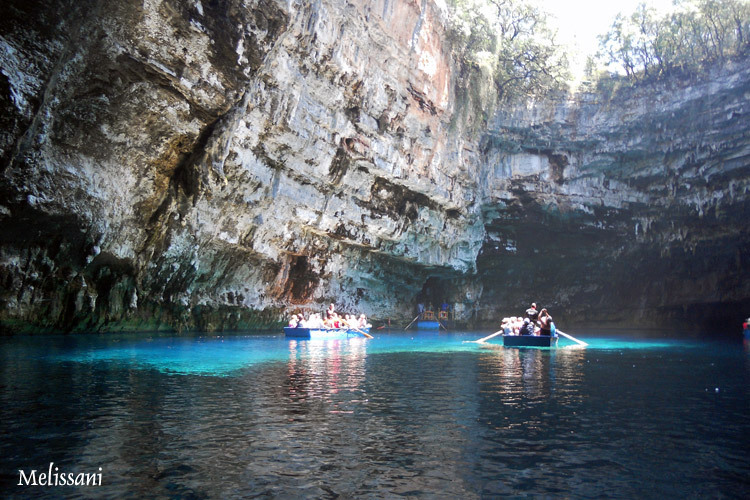 The Catavothres consist of an extremely rare geological phenomenon here in Greece you can see only on the island of Kefalonia, only 2.5 km from the capital Argostoli. Since ancient times the people of Cephalonia have noticed that the waters of the sea lapping on this small stretch of coast, insinuate themselves into the rocks and the water literally disappears underground. The English Stevens was the first to take an interest in this phenomenon, and was so impressed that he decided to build a water mill here that exploited the power of this natural phenomenon. 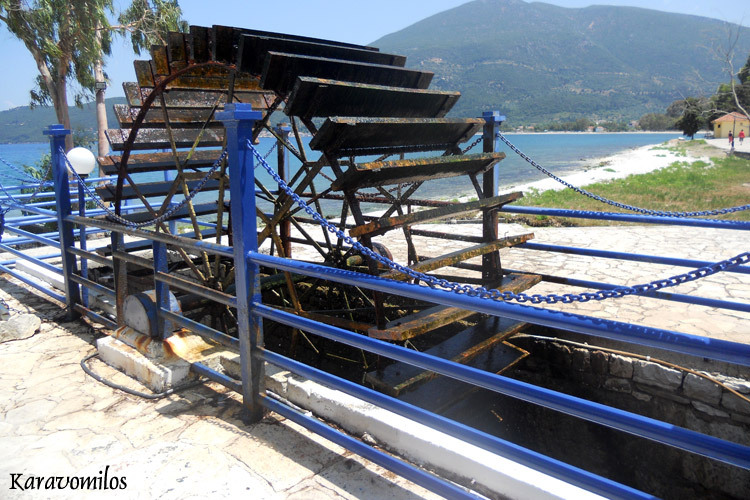 Subsequently, the famous geologist Greek Miliaresis took care to study the effect of earthquakes on the phenomenon of Katavothres and realized that even violent earthquakes such as the 1867 not saints felt no effect, or change it on the operation of the mill, nor will the geological phenomenon itself. 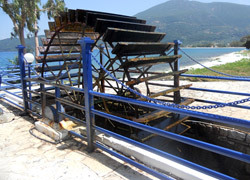 Even during the recent earthquake in 1953 that destroyed the island of Kefalonia, the phenomenon has not changed, except that the mill, badly damaged, was replaced. 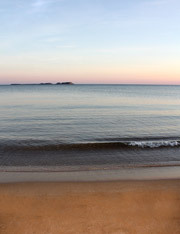 Several theories have occurred over the years for groped to understand and explain where it ended really seawater once swallowed by Katavothres. The answer came only in 1963 by a team of geologists from theAustrians. 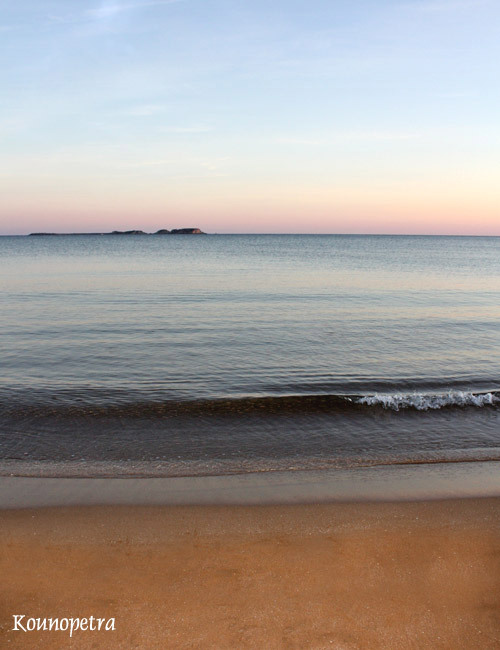 These researchers poured a dye in the water before it disappeared in Katavothres and surprisingly discovered that the colored water reappeared after about 27 days in the sea in front of the village Karavomilos. 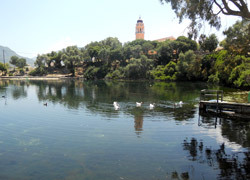 They discovered that the water follows an underground route, crossing the island in the north - west for 17 km and mixing with the fresh water present in the groundwater aquifer comes first within the Melissani Lake (photo on the right) and then in Kravomilios Lake (the two photos below), before emerging again in sea. 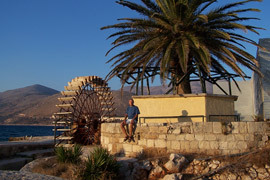 The Kounopetra of Kefalonia island, also known as the "stone that moves", is a natural phenomenon of its kind that is unique worldwide. The Kounopetra consists of alarge flat-shaped rock that comes just from the sea and is located in the west of Kefalonia, opposite the village of Manzavinata. 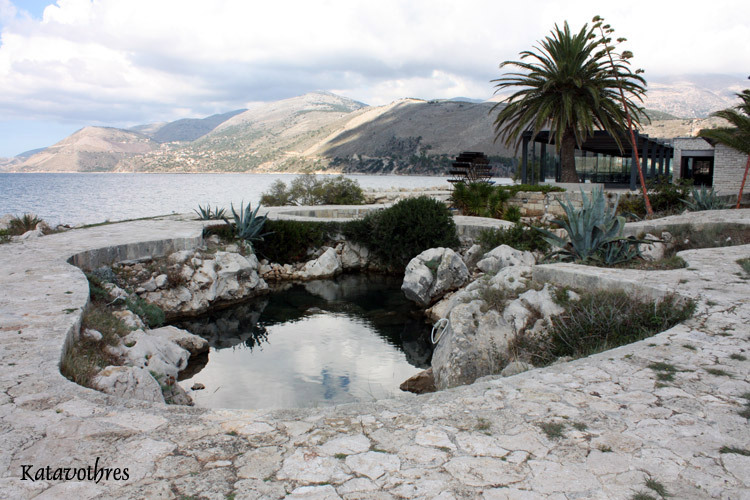 This stone is known because it has never been stopped in the same place and the same position, precisely because of its rhythmic and continuous movement was already known to the inhabitants of Cephalonia before 1900. 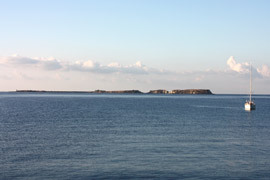 Since the past has attracted the attention and curiosity of many scientists, so that the distinguished scholar Greek Kostantakatos describes the Kounopetra as follows: "The Kounopetra is a gigantic monolithic rock with a circumference of 20 meters just emerging from the sea and moves constantly from east to west. 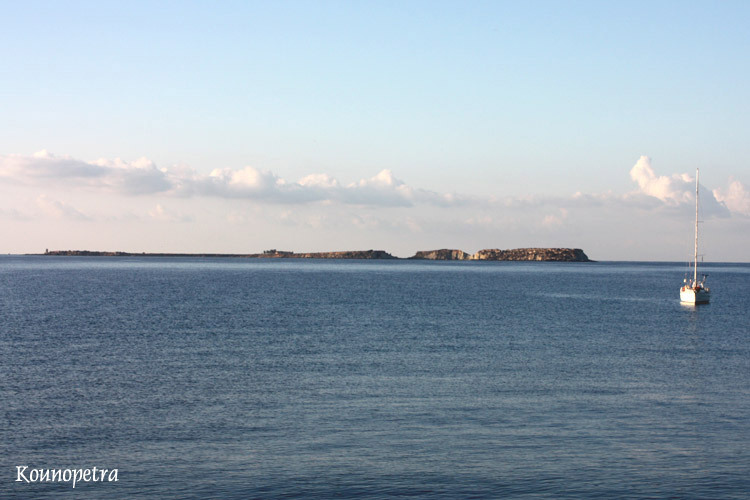 The slow move of the rock is visible from the coast, but stationed on it is even possible to hear the vibrations; the Kounopetra moves with a frequency of 20 times per minute. This amazing rock, which since 1867 has gradually moved away from the coast, has been in the past an attempt by the British navy to tow it away, but has turned into a stalemate. 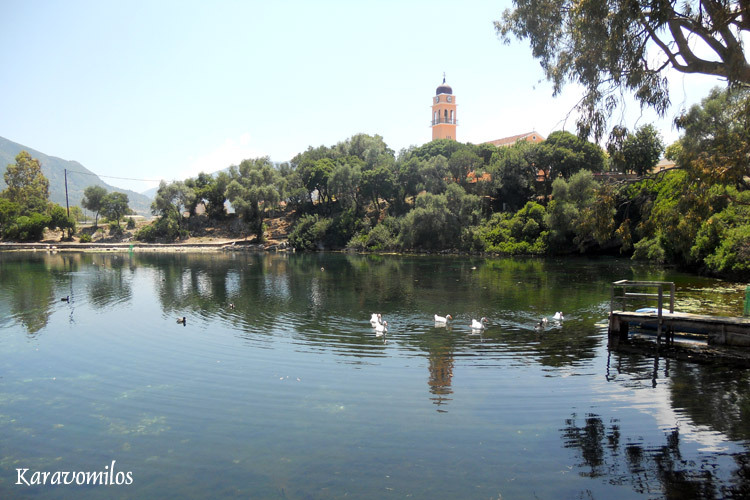 With the terrible earthquake of 1953 there has been a shift at the base of Kounopetra that has since taken a firm stance".